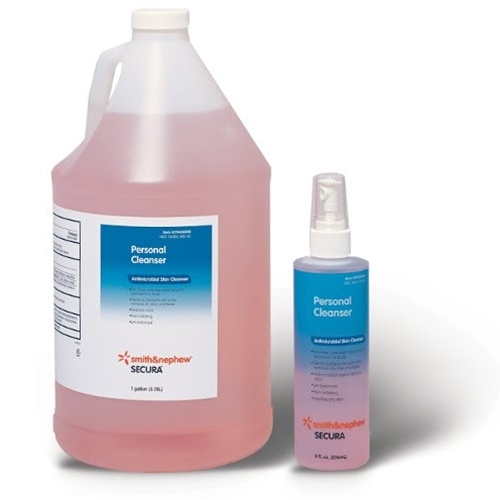 Smith & Nephew Secura Personal Cleanser from HealthyKin.com is an antimicrobial skin cleanser for perineum and body. It aids in removal of urine and feces or other foreign material. I LOVE this product! As an ileostomate, I use the cleanser to remove any of the oily residue left after using the adhesive remover wipes, each time I change out my ostomy bag/seal. Not only is this an outstanding product, but, Healthykin offered the best price by far and delivery was VERY fast! Was introduced to this products cousin (foam) while in the hosptial for surgery. Was very impressed with it and looked up where I could purchase after being discharged from hosptial. Order the liquid because it is a better value than the foam. First introduced to this when my mother was sick. When she passed away, I brought the full bottle home with me. This product is excellent. As we women age, we need as much help as we could get. I don't know whats better the product or the price. I work in a hospital and use it on patients. I was thrilled to go on line and see that it can be delivered to residential residences. I don't have medical issues but use it every day. I like the product so much that I ordered an entire case and its just for myself. Great product...introduced in the rehab center. Found online and order for use in homecare of my Mother. Healthykin had best price and shipped promptly. Has a good smell NOT medicinal. This product is fabulous with a single caveat, the coloring. I suspect it could be lightened or eliminated with no effect on the product's effectiveness. This is a staple in our home, but it can stain toilet seats over time. Still worth buying! secura personal cleanser is without equal. excellent product. I used it for the first time when I was in rehab after surgery. Happy to have found it thru healthykin. Thank you for prompt delivery! Was introduced to this product while in the hospital. Could not find in store but found it here so bought a gallon! Fast delivery great price wonderful product!